Hi DIYers! 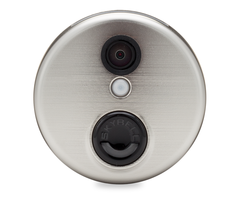 Did you know that SkyBell Video Doorbells can be viewed from Total Connect 2.0 or Alarm.com? Many users prefer using one of these apps instead of the SkyBell App so that they can have all their security functions in one convenient location. This is great for Alarm Grid customers! One of the biggest perks of having a video doorbell is being able to know immediately whenever there is activity in front of your house. The SkyBell will send you push notifications whenever its built-in motion sensor is activated or whenever someone rings the door bell. You will receive the alert from anywhere, even if you are away. Although you can still choose to receive these alerts through the SkyBell App, you can also choose to have them sent through TC2 or ADC. Keeping these alerts in TC2 or ADC is perfect for keeping all your security events nice and organized. Once the user receives a push alert on their phone, they can press a button to immediately connect with their SkyBell Doorbell and see exactly who is at their door. Each SkyBell device also comes equipped with a microphone and speaker so that the user can have a live conversation with the present individual. This way, you can tell your friend that you'll unlock the door for them. Or you could ask a postal work to leave your package by the door. There are so many possible applications with SkyBell. Additionally, a user can access their Total Connect 2.0 or Alarm.com account to pull up their video doorbell at any time and see if there is any activity occurring. This is excellent for getting a live look-in at the front of one's house. It doesn't matter if you are at home or across the country. With remote access, your home is at your fingertips from anywhere. The devices support video resolution of up to 1080p HD, so you know that the video will be crisp and clear every single time. At this time, Alarm Grid offers four SkyBell models. Specifically, there are two models for Total Connect 2.0, along with another two for Alarm.com. Both TC2 and ADC have a round model and a trim model. The round and trim models perform the same functions, but the trim models are slightly more compact. You don't necessarily need an alarm monitoring plan with video surveillance to use one of these video doorbells. Alarm Grid can add the feature at no additional cost for any existing customer who has access to Total Connect 2.0 or Alarm.com. 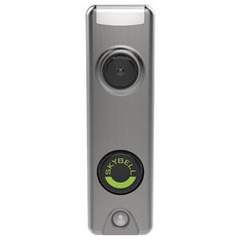 For that reason, the SkyBell Doorbell Cameras are a great cost-saving option for any user considering traditional security cameras and a monitoring plan with video surveillance. Simply let us know that you want to add a video doorbell to your monitoring account, and we will take care of the rest. If you want to learn more about our monitoring plans, you can always check out our monitoring page or reach out to us. The best way to contact is us by email at support@alarmgrid.com. You can also call us during our normal business hours of 9am to 8pm EST M-F. We look forward to helping you plan and design the perfect security system for your needs! As you may know, stolen packages is a very serious problem today. It's easy for a common thief to walk right up to your doorstep and make off with your belongings. And in many cases, these criminals get off entirely scot-free. Well one victim decided to take matters into his own hands. This YouTuber managed to rig up a contraption that, upon opening, would spew out more than a pound of glitter and shoot out continuous sprays of fart gas. It also included four smartphones that would record the reaction of the unsuspecting thief and upload the footage to a cloud server for later viewing. Needless to say, any package thief unfortunate enough to steal this guy's mail certainly got what's coming to them! We gotta give it to this guy for this genius idea, and we're sure that no thieves are going to mess with his packages ever again! While Alarm Grid doesn't have anything quite like this, we do offer SkyBell Doorbell Cameras that you can use to record any bad guys who try and violate your privacy. You might also have some luck with our new Arlo Cameras as well. But props to this smart YouTuber for putting together a great way to get back at some thieves!